Runs with Sole: Running CAN be fun! When some people find out I'm a runner, they tell me how much they hate running. Really? You HATE running? I can see how it can be difficult, we all have those runs where everything just feels bad. But hate is a strong word. When I hear that someone hates running I just know they're not doing it right. Whether it's not wearing the right shoes, clothes, sports bra, or running in a boring area, there are a number of reasons why running can stink. But once you figure out what works for you, running is about as fun as it gets (for me anyway). Case in point, I have a pretty cool job. I get to run for a living as a coach, I get to plan awesome running events, and I get to market and promote an industry that supports my habit. 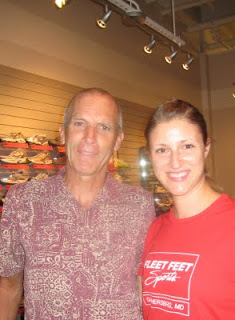 For instance, last week I got to hang out and run with one of the most well-known runners in the business, Bart Yasso. Bart came by our store for a book signing and fun run. He's a super nice guy and if you ever get the chance to read his book, do it. He's had quite the adventure. Last night was our Halloween fun run. I have to say I had a blast with this one. 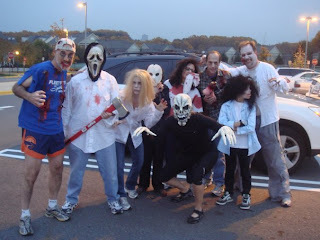 We recruited a bunch of people to dress up as zombies and we planted ourselves along the running route. The runners didn't know we were there and we scared the you-know-what out of some of them. I think it was a close call as to who had more fun, the runners or the zombies. And today, my Girls on the Run group meets. We'll be running around in our costumes having a ball. It just doesn't get any better than that.